Stepping up provides free, community-based computer and internet training for adults, suitable as a follow up to the Computers in Homes programme. It’s designed for anyone with basic computer knowledge to develop their skills a step further in areas of direct relevance to their work and life. 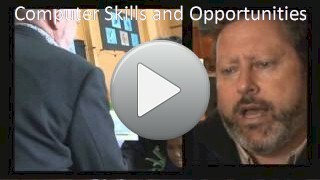 The programme provides a number of training modules, helping New Zealanders make better use of their computers and internet connections. The training modules (called digital steps) are designed to be completed in no more than 2.5 hours, typically delivered in partnership with public libraries. The 20/20 Trust launched the Stepping UP digital literacy programme in 2009 with support from Microsoft’s Unlimited Potential programme. Since then, over 10,000 people have completed one or more digital steps (June 2016). In 2013, the programme was expanded to include a number of basic digital steps designed for new computer users.